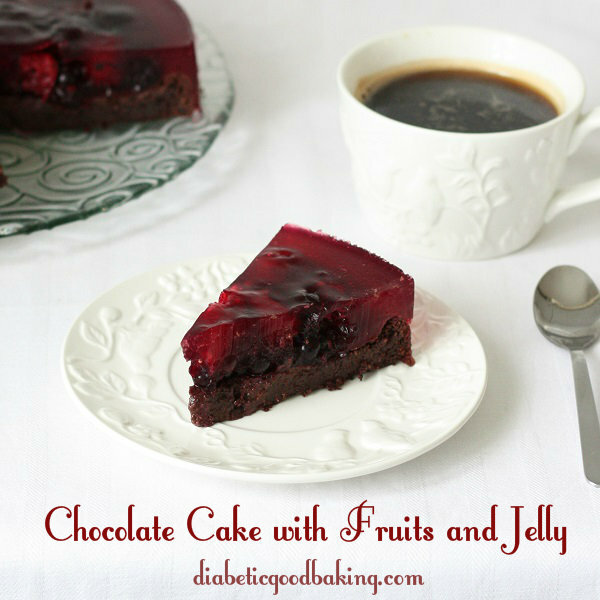 Great combination of rich chocolate cake with black forest fruits and jelly. The cake itself has a strong chocolate taste and it’s very moist. It’s a bit like chocolate brownie but less chewy and slightly lighter. Top layer of refreshing black forest fruits and jelly it’s a bit surprising on that rich cake base but it all goes well together. I really didn’t know that chocolate tastes so good with cherries and blackberries! · Preheat oven to 160C and line spring form tin with baking paper. · Heat up the milk and add the chocolate. Stir until dissolved and set aside to cool down. · Sieve soya flour, cocoa, baking powder and bicarbonate soda into the bowl. Add ground almond and mix all together. · Using electric mixer beat the egg until light and creamy. Add sweetener and continue beating. Pour in oil, soured cream and vanilla extract and beat for further few minutes. Add milk and chocolate mixture and beat until well combined. · Fold in flour mixed with cocoa and ground almond. · Pour the batter into the tin and bake for about 30-35 minutes . Check with a skewer if the cake is baked (the skewer should come out clean). Let it cool down. · Dissolve 23g jelly sachet in 850ml hot water (you need less water than in instructions on the package). Cool it down and refrigerate until jelly just starts to set (if the jelly is too runny it will get soaked into the cake). · Place the fruits on the cake and pour the jelly over it. Refrigerate until jelly get set.